French Art Deco diamond engagement ring with big Burmese ruby: Description by Adin Antique Jewelry. In this platinum French Art Deco engagement ring, a certified natural Burmese ruby worth its weight of 3.19ct. in love transcends from 30 old brilliant and single brilliant cut diamonds aligned over the domed top. The white luster of these eight pierced pillars of passion intensify this gleaming gem as shimmering dew drops do with a burgundy rose in early dawn. One day, you could wake up with this ring being more than just a wondrous dream. Diamond(s): 30 old brilliant cut diamonds and single brilliant cut diamonds (also called 8/8) with an estimated weight of ± 0.50ct. (colour and clarity: F/J, vs/i). Total diamond weight: approx. 0.50 crt. 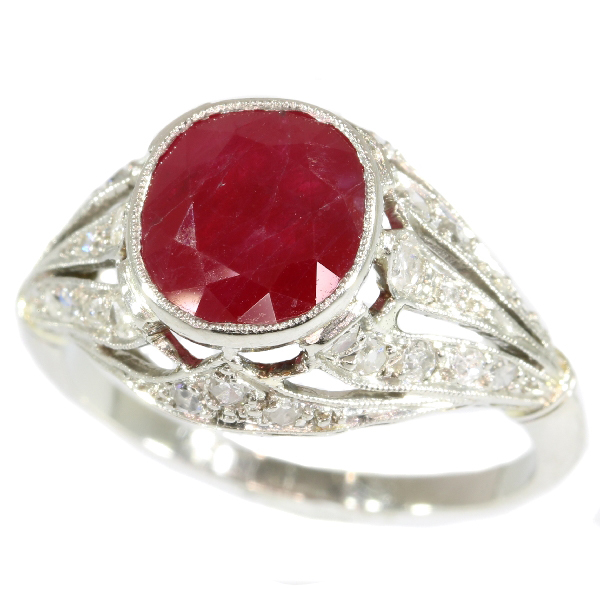 Treatment: heat treated, natural rubies are commonly enhanced by a thermal process. This is an accepted technique as long as it is mentioned by the seller. Hallmarks: The French control mark representing a "mascaron" (French for "grotesque mask") that was in use in France from 1912 and used for into France imported platinum jewelry and objects.